Photos by Rachel Von | The Journal Gazette Firefighters work to extract Harmeyer during a grain bin rescue exercise Saturday. In 2010, 51 people became trapped in storage bins, and 26 of them died, according to the Occupational Safety and Health Administration. Rachel Von | The Journal Gazette Farm Bureau Insurance partnered with Lutheran Trauma Center to work with Stateline Farm Rescue, an agricultural rescue training agency, which educated about 40 first responders. 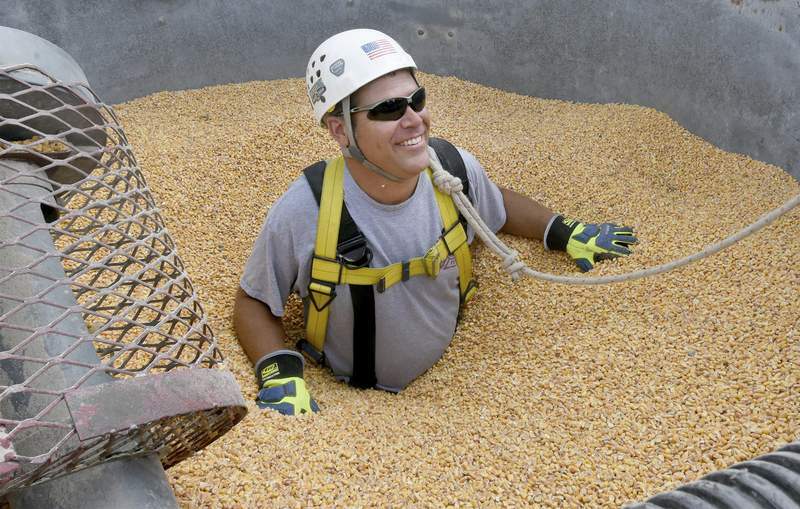 Russ Harmeyer, a firefighter from the Arcola Fire Department, prepares to be “rescued” from a grain bin Saturday. Mark Baker doesn't mess around when it comes to teaching volunteer firefighters how to rescue someone trapped in a grain bin. Even when it's a carefully controlled situation. Baker knows that every minute counts when someone is trapped, being slowly crushed by the pressure of corn or soybean kernels. It's like a drowning, he said, with the victim unable to breathe because of the intense pressure placed on his chest. “The pounds of grain pressure on their bodies constricts them over and over,” he added. 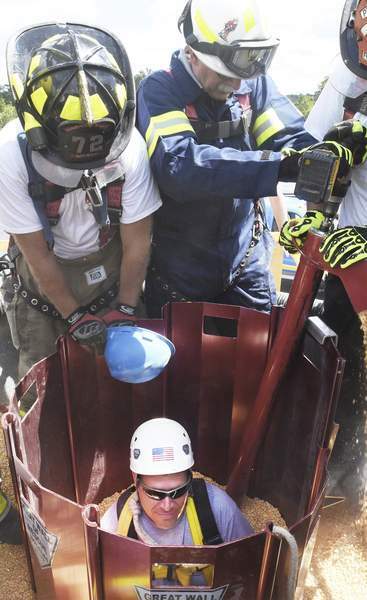 About 40 volunteer firefighters gathered Saturday on the Lutheran Hospital campus in southwest Fort Wayne for training in grain bin and farm equipment rescues. They represented Woodburn, Avilla, Poe, St. Joseph and other areas in Allen County. “We're trying to protect our best resource, which is our farmers,” said Baker, a trainer with Stateline Farm Rescue. The Orangeville, Illinois, company travels the country, training first responders in rural areas how to rescue farming accident victims. Grain, experts say, can act like quicksand when someone is walking inside a silo to try to move it. Allen County Farm Bureau Inc. sponsored the all-day training, which included classroom and hands-on sessions. Last year, two people were trapped in grain bins just in the eastern part of Allen County, said Tom Miller, who is vice president of the local farm bureau's board. Jeb Sheidler, executive director of Lutheran's trauma services, said the majority of farm-related accidents are preventable. But, when they do happen, rescuers need to know what to do. Sheidler taught the responders how to control heavy bleeding after a victim has been removed from farm equipment, such as an auger. When a tourniquet isn't available, a pumped up blood pressure cuff can work in a pinch, he said. Saturday's training included how to use tools to cut into grain bins' sheet metal sides. Katherine Tsakkos was one of the volunteers who climbed into the grain bin. The pressure on her legs and hips was intense she said afterward. Sam Sliger, who has volunteered with the St. Joseph Township fire department for more than four years, has never been called out on a farm rescue. Confidence in mounting a grain bin rescue. The sobering part was learning out to cut into grain bins to lessen some of the pressure. 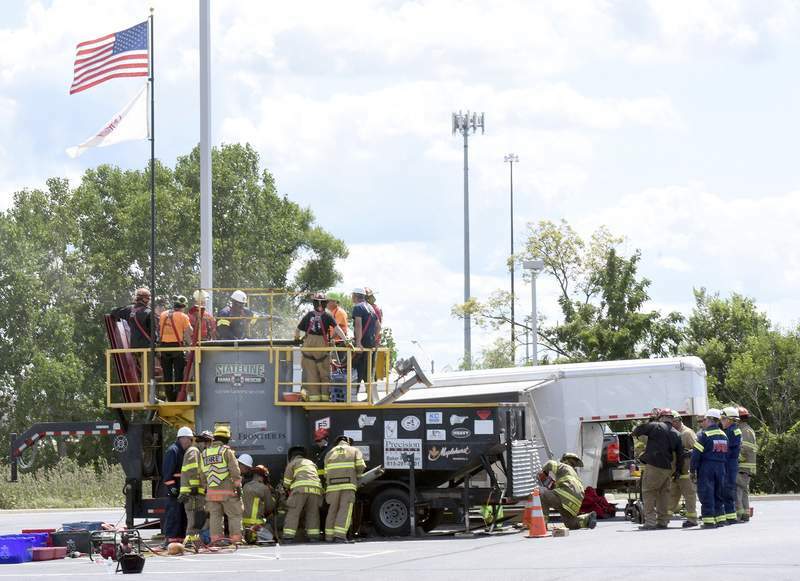 Because rescuers want to provide quick relief, they might need to wield those power tools while dangling dozens of feet in the air if someone is trapped near the top of a 40- or 50-foot silo, Sliger said. “It's a gut check,” he added.